With a flourish of long, colorful skirts, the members of Trainor Dance take their places for the day’s last run-through of their newly finished piece. The company will open its fourth performance season this weekend at Manhattan Movement and Arts Center, and though the seven dancers are undoubtedly tired, they betray no fatigue as they kneel and place their heads to the earth. It’s an image befitting the opening of a contemporary concert dance work, as Trainor is well aware. “Faux Pas,” Trainor’s newest work for her ensemble Trainor Dance, is, in many ways, a modern dance about modern dance. The voluminous skirts alone evoke a handful of moments in dance history – from Eastern European folk dances and whirling dervishes to Loïe Fuller and the 20th-century fascination with “skirt dancing” set to classical music (Trainor has selected Mozart’s Piano Concerto in A for this piece). Hints of Martha Graham in “Lamentation” appear throughout, and Paul Taylor can be seen in Trainor’s attention to line and form. She’s clearly done her homework, but rather than ask what a billowing skirt or parallel arm position means to her viewers, Trainor prefers that we take these moments for their holistic worth. “Faux Pas” “doesn’t warrant translation,” explains Trainor. “Don’t walk away asking about meaning; it’s about the experience.” Observing the pervasive commuter trend of phone screens taking precedent over spontaneous social interaction, Trainor felt this new work should foster a return to “body-to-body immediacy,” and offer viewers a chance to share a kinetic moment. Regardless of how they choose to view the piece, Trainor hopes that each person in the audience will see themselves reflected in the bodies of the dancers. Indeed, consideration for the overall design of the work has been at the heart of her creative process. 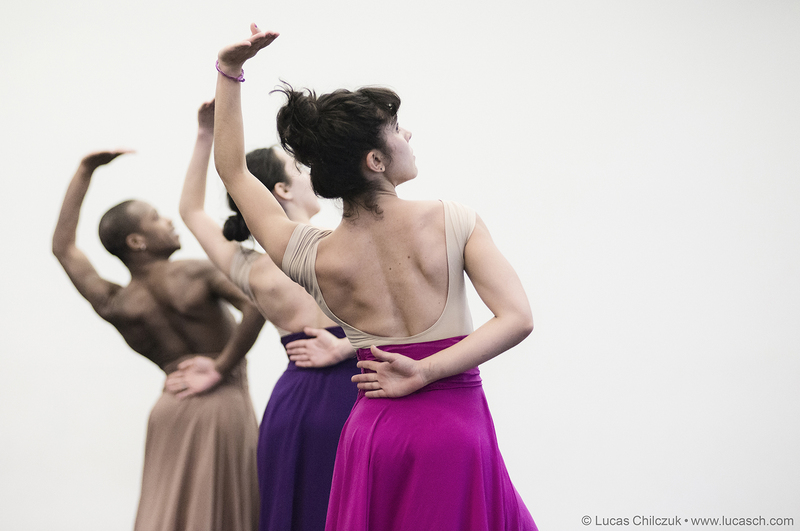 Starting out with only a few phrases of choreographed movement, Trainor invited dancers to join her in the studio early on in the creative process. It was important, she notes, to see the visual as well as the physical design of the work’s many layers, and to consider the fabric as another dancer. While Trainor Dance’s momentum is steadily climbing, Caitlin Trainor is most recognizable in the Columbia community as a member of the Barnard Dance Department faculty. Her beginning modern classes are a favorite of curious students, and Trainor appreciates their willingness to learn and experiment. Allegra Herman, also a Barnard student dancer, who will be performing in “Faux Pas,” sees Trainor’s encouragement of individual growth as one the company’s strengths. “While we remain unified by [Trainor’s] style of movement, each dancer is able to bring something unique to the work which allows us to showcase our diversity as an ensemble.” As a younger dancer, Herman sees her experience with Trainor Dance as a learning opportunity. “I’m trying to be a sponge,” she says, “and soak in all the talent and wisdom that each dancer has to offer.” Two other Columbia students, Kaitlyn Gilliland and Holly Curran, will also perform with Trainor Dance this season. This is not Trainor’s first time creating new dance works with Columbia University students – this past spring, she choreographed “Courante” on dancers from Columbia Ballet Collaborative. An intense study of the dancing body’s ability to personify a wide range of musical qualities, “Courante” will also be performed this weekend. Rounding out the program is “self portrait, reflected,” a solo choreographed and danced by Trainor that incorporates videography into its exploration of personal and family histories. While Trainor admits that it is a challenge to balance the administrative, creative, and interpersonal needs of a dance company, having a consistent group of dancers is certainly an artistic advantage. It provides an opportunity to “express your vision and ideas broader than you can as an individual artist,” and is a space for creative conversations between different dancing minds. Though there will always be work to be done, her determination in these early years is paying off. In performing their work this weekend, Trainor and her company show that sometimes the deepest meaning of their art can only come from sharing it with the world. Trainor Dance’s Fall/Winter 2014 program will be performed at 7:30pm on Thursday, Friday, and Saturday, December 4-6, at Manhattan Movement and Arts Center, 248 W 60th Street. Tickets are $20 for students, youth, and seniors, and $25 for general admission, and are available online or at the door. Visit Trainordance.org for more information. An abridged version of this preview was originally published on Wednesday, December 3rd, 2014 online by the Columbia Spectator.